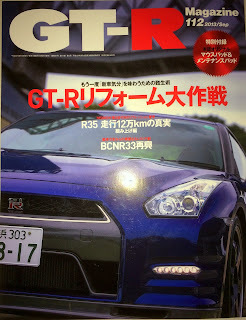 GT-R Magazine #112, September 2013. In the magazine they list total Nissan R35 GT-R sales for Japan. The data is current as of June 2013. Since 2007, Nissan has sold 8030 (as of June 2013) Nissan GT-R’s in Japan. The following chart breaks down the 8030 total cars sold by model. US Total sales have been 7686 units. The most popular seller by far was the Black Edition. Only 56 total SpecV’s sold. One more since last year. Only 25 EGOIST. The Black Edition in Japan is less expensive because, it does not have the same wheels as the US car, or for 2013, it doesn't have the carbon fiber wing. Just the wing alone is around $10,000 from the Nissan dealer.